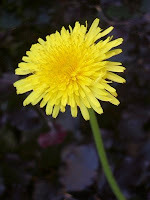 Searching the Internet for all kinds of remedies against Arthritis, I came across the healing powers of Dandelion leaves. It is said, that this is probably one of the best remedies for arthritis and related conditions. Dandelions are not hard to find. They may even grow in your back yard. They do in ours, haha. Fresh and young dandelion leaves are high in vitamin A and C. You can eat them raw, like in a salad. They help the body to repair damaged tissues and assist the liver clearing toxins out of the blood. 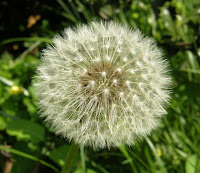 Homeopathic doctors in Europe, apparently have used dandelions for years in several recipes, as a pain reliever. It is recommended to steam, or sauté the older leaves. They are too tough to eat otherwise. In case you are not too crazy about the taste, try cooking them with garlic, or add olive oil. I suppose, you can also add some of your own favorite herbs and spices, to improve the taste and make a nice dish. Dandelion can also be made into a tea by adding 1 teaspoon of dried leaves, or 3 teaspoons of fresh leaves, in 1 cup of boiling water. You can also make 'coffee' with it. To brew the coffee, boil and strain 4 ounces of fresh root in 2 pints of water. That last is said, to be a great remedy against winter colds. However, the beverage will be bitter-tasting, so be warned when you take your first sip. It seems like this little weed not only can spruce up our yards, but also our lives. Even though the taste may not appeal to our taste buds, not all that tastes bad, is bad.